Today we are sharing the matching bookshelf to Brooks’s bed we shared a few weeks back. Be sure to check out the Youtube video tutorial HERE or below! First, please forgive me for the lack of actual process photos in this post. I accidentally deleted them when cleaning off my computer and about cried. Ask me anything that isn’t clear in the steps! Now, you can go download and print the FREE PLANS by clicking HERE! The first step to building the nightstand is to build the base cabinet. After making the cuts, make 3/4″ pocket holes on each of your horizontal boards for both frames. We used our K5 Kreg Jig for this part. You can see it HERE on Amazon. Attach the horizontal boards to the leg pieces using 1.25″ pocket hole screws. The top boards will be flush and the bottom boards will be 1.5″ from the base of the legs. Next, attach the planks. These are attached using wood glue and 1.25″ brad nails. We used our Ryobi 18G nailer for this part. The top board will be flush with the top of the frame and then work your way down. Now attach the bottom board. We used a pine project panel for this one, but you can also use plywood. Make 3/4″ pocket holes along the bottom of both sides and the front of this piece. Attach it to each side using 1.25″ pocket hole screws. Make sure to add wood glue in between all of your joints. You want the pocket holes facing down. Now for the front frame. 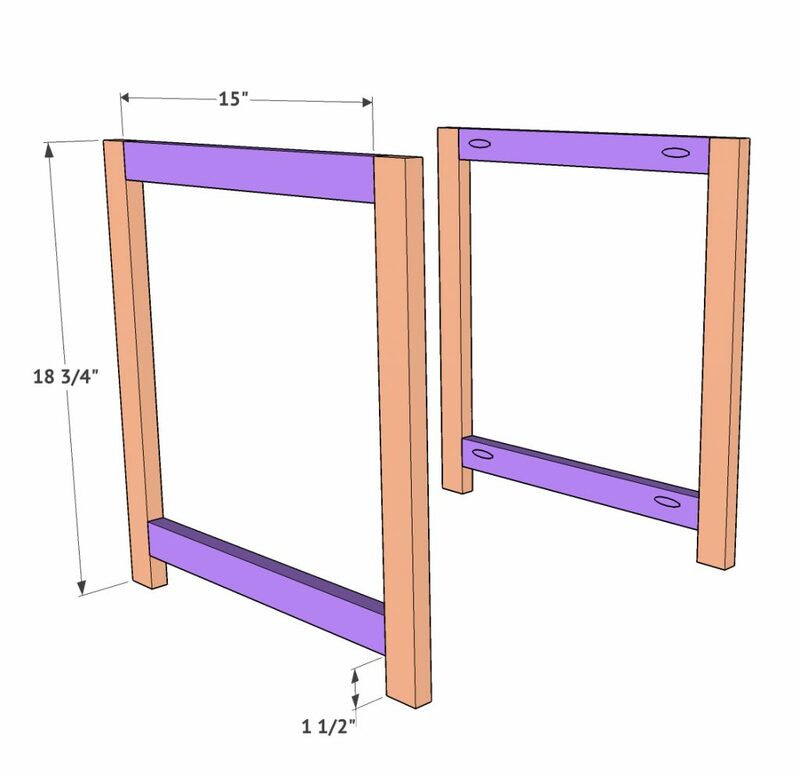 You build this exactly like you did the two side frames, but the horizontal boards are a bit longer. Once you have built the frame, attach it to the front of the cabinet using wood glue and 1.25″ brad nails. Then, also attach the bottom board to the frame using the remaining pocket holes you made on that base board. Now add the top! This is also a project panel. If you choose not to use project panels, you will need to modify your cuts and also trim the edges of the plywood. Project panels just worked so well with this design. They stain well and they are affordable. Nail the top board to the base cabinet using wood glue and nails. Now for the door! To build the door, make your cuts and add 3/4″ pocket holes first. Then, attach the vertical boards to the two horizontal boards to create the frame of the door. Attach them using 1.25″ pocket hole screws. Once you have the frame built, attach the 1/4″ plywood panel to the back of the door using wood glue and 5/8″ staples or nails. Then, turn the door around and mark your diagonal boards to get an exact fit and make those cuts. Attach those boards by using wood glue and nails or staples through the back of the plywood and into those pieces. We will attach the door after the finish is added, so it’s time for the top! First, cut and add 3/4″ pocket holes to the shelf supports. Then line up the boards as shown in the pic and attach them to the base cabinet using wood glue and 1.25″ pocket hole screws. Next, add the top of the shelf through the pocket holes using wood glue and 1.25″ pocket hole screws. This is also a project panel we use for the top. Now time for planks. Just like we did on the base, we will attach planks to the inside of those support boards using wood glue and 1.25″ brad nails. You may need a mallet to help you get that last board in if it’s a bit snug. Once both sides are done, add the two front trim pieces. These are attached using wood glue and 1.25″ brad nails. Attach the shelf supports next. The front of these are cut at a 45˚ angle just for aesthetics! We lined ours up flush with our second plank, but you can attach yours wherever fits your storage needs the best. Attach it to the inside of the planks using wood glue and 1.25″ brad nails. Now attach the shelf board using wood glue and 1.25″ brad nails through the top of the shelf board and into to shelf supports. The side trim pieces are next. These just give it a finished look on each side. Attach those the same way… with wood glue and brad nails. Final step to building this baby is adding the 1/4″ plywood to the back. We like to use staples for this part, but you can also use nails if you don’t have a stapler. We stained this nightstand using Rust-Oleum’s Varathane stain in Briarsmoke. If you can’t find it at Home Depot, you can find it HERE on Amazon! The pulls I used are HERE on Amazon! The door hinges can be found HERE on Amazon! How cute are those lights?? I LOVE them! I found them at Ikea super cheap and they have a little switch on the cord so he can turn them on himself. Remember, if you get stuck on a step be sure to check out the video. We try our best to walk y’all through it! Thanks so much for stopping by! We would LOVE for you to share this with all your peeps! Was wondering for these plans did you guys cut the wood for a straight edge like the bedframe? So you guys don’t have crum catchers? 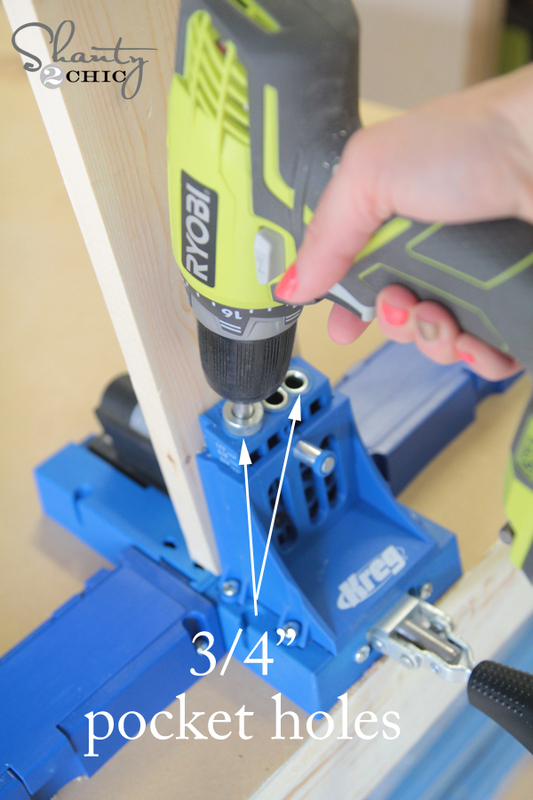 I love your site and projects they are awesome, do you have any video on using the Kreg Foreman machine? How would I change the measurements for a full size bed & if I wanted it taller. Did you ever figure this out? I was wondering the same ..
Where is the navy and orange bedding from? what are the bed plans that are in the pic with the nightstand? How can I get the lists for the tools, cutting and materials as well as cutting diagrams? I copy and paste onto a Word doc so I can add notes, remarks and ideas for my personal use. I very rarely use the PDF as listed above. If that could be added under comments on the tutorial, I could get from there. thanks.